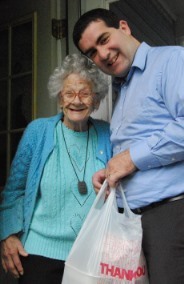 The Meals on Wheels program provides homebound elders with a nutritious, hot meal each weekday at the noon hour. Frozen meals are available for those elders who are in need of weekend meals. All meals are cooked with no added salt. Sugar free desserts are available for diabetic clients and lactaid milk is available for lactose intolerant clients. There are no income guidelines; however, there are frailty guidelines. For more information call Elder Services (413) 499-0524. The Congregate Meal Program provides a nutritious hot meal at 14 senior lunch sites at the noon hour. Seniors 60 years and older "congregate" at a local meal site often located in a nearby senior center to eat and socialize. Congregate meals are often combined with recreational and educational activities. Informative and interesting programs and guest speakers are regularly scheduled to follow the meals. All meals are cooked with no added salt. Sugar free desserts are available and lactaid milk is also available. Reservations requested 24 hours in advance. There is a suggested donation of $2.00/meal. For more information call Elder Services (413) 499-0524. 528-4118 Claire Teague Senior Ctr. 83 North Main Street 11:30 a.m.
499-9346 Ralph J. Froio Senior Ctr. 5 Pine Street 11:30 a.m.
*The Jewish Federation of the Berkshires offers an Older Adult Kosher Lunch Program in conjunction with Elder Services. Copyright © Elder Services of Berkshire County, Inc.